Parenting confession – I bought these magnetic dress-up dolls for me, not my daughter. Just because I got them from a toy shop, daughter in tow, with the sales assistant saying to her “You’re a lucky girl!” is beside the point. Although it does explain why my daughter has been desperate to get her mitts on them ever since. With a penchant for all things Art Deco, how could I go past the Vintage Fashion Dress-up Dolls from Mudpuppy? Featuring mix and match fashions from the roaring twenties and the glamorous 1930s plus four different background scenes, it is irresistible and portable fashion fun. 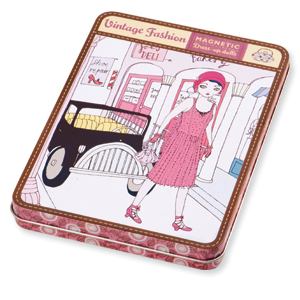 Cloche hats, fur-trimmed jackets, flapper dresses and co-ordinating handbags – the details are superb. Mudpuppy have a huge range of magnetic dress-up dolls, including mermaids, ballerinas, world travellers and the athletic ‘At the Stables’ and ‘Sporty Girls’ sets. The term ‘dolls’ should be used loosely – there are also robots, monsters and pirates. 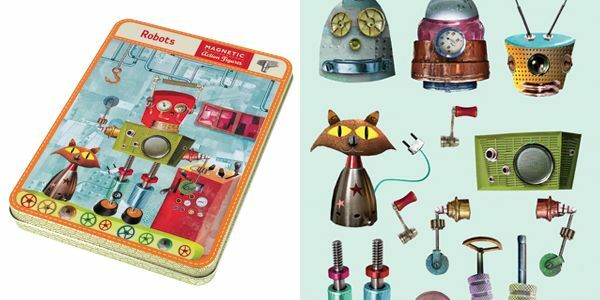 The robot set, illustrated by Argentinean designer Pablo Bernasconi, is particularly lovely. Despite buying these dolls for myself, I have relented a little on who is allowed to play with them. They now adorn the filing cabinet in my office and are a welcome distraction for little visitors when I’m on the phone. They also make a great travel toy. Mudpuppy sets are $32 each and are available from That’s My Toy.